In a nation created by immigrants, nothing has been more debated than what should be the ideal character of its citizenry. One view is that “multiculturalism,” the preservation of diverse cultural heritage, enriches the country. Some have called for a common citizenry—a “melting pot” where immigrants are assimilated and their traditions are transformed into a homogeneous American culture. Still others challenged diversity by seeking to restrict immigration and exclude certain racial and ethnic groups. These very different positions have greatly impacted the nation’s political debates on economic, foreign, and immigration policy, and education and social welfare programs. 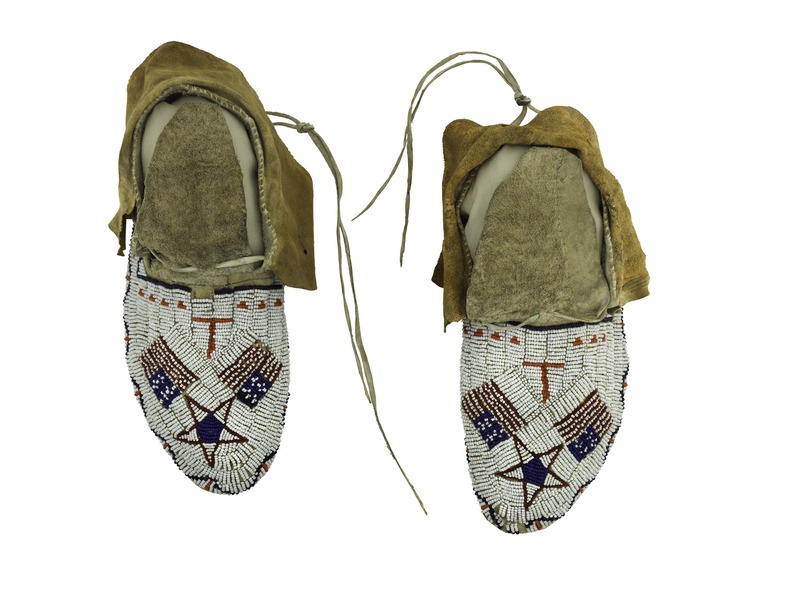 A delegation of Plains Indians gave these beaded moccasins to President Ulysses S. Grant during an 1870s peace conference in Washington, D.C. 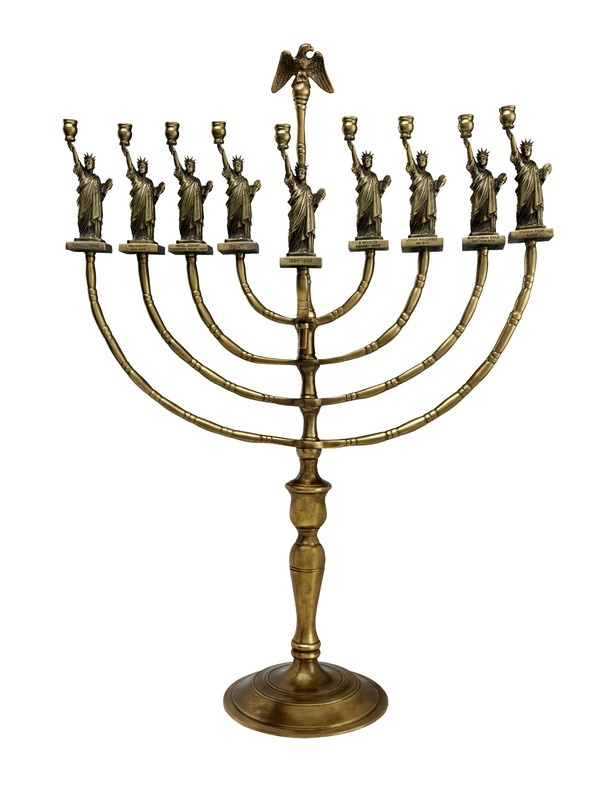 The design unites motifs and forms from both cultures as a powerful statement of hopeful coexistence. 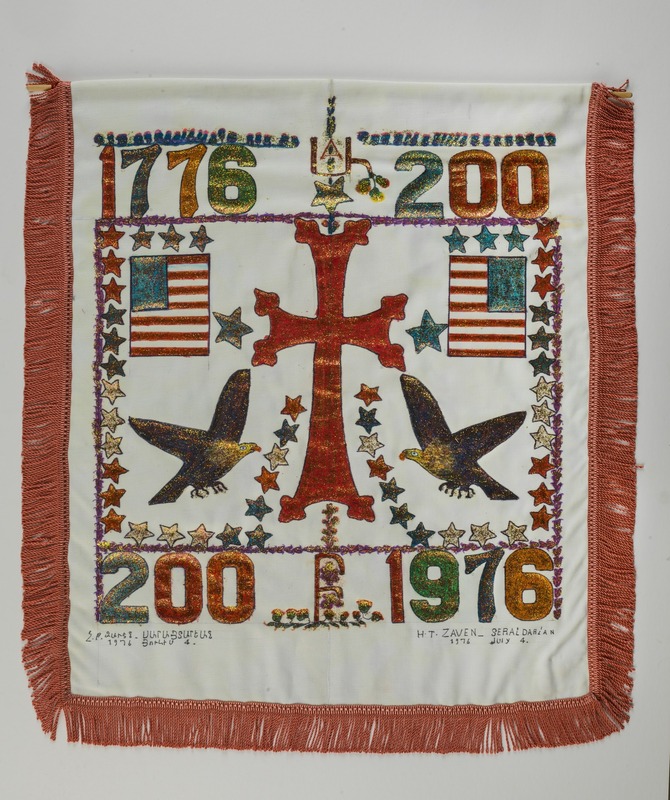 Zaven Seraidian, an immigrant from Armenia, created this banner in 1976 to celebrate the bicentennial. According to Seraidian: the Armenian letter for A symbolizes “the beginning” and the letter for B expresses “continuity”; the Armenian cross is a symbol of Christianity brought from the old world to the new; the two American eagles are for strength and victory; and the flag represents independence and liberty from tyrannical oppression. The Ford Motor Company dramatized the ideals of Americanization in its elaborate English school graduation pageants. Workers in foreign dress entered into a giant pot stirred by the school’s teachers and emerged in their best “American” clothes waving United States flags. 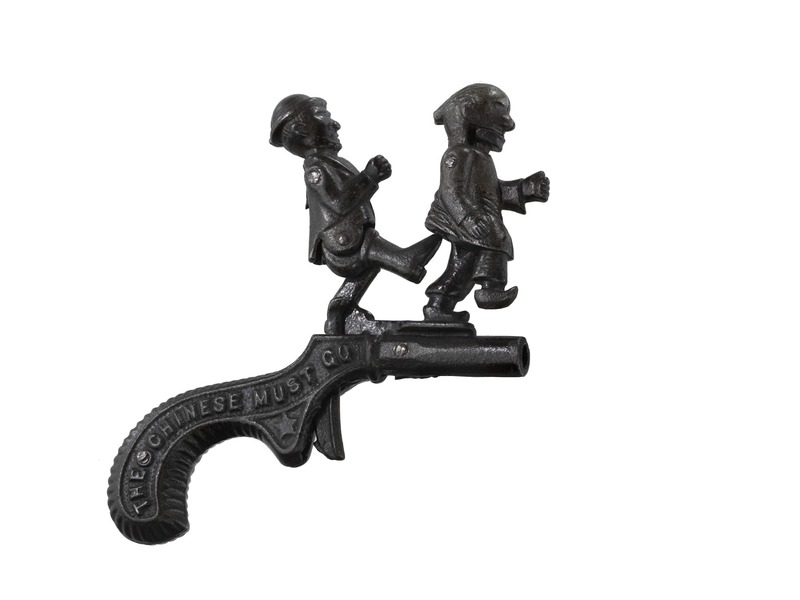 From 1880 to 1920 over 20 million people, largely from eastern and southern Europe, came to the United States. In response, the government and industries developed Americanization programs to turn the foreign-born into patriotic citizens by teaching “real American” values and English. Poster, "Many Peoples One Nation"
This poster, issued by the private National Americanization Committee and distributed by the Department of the Interior’s Bureau of Education, represents the ideals of the Americanization movement through the use of the flag and its symbolic message expressed in verse. Although the ideal of Americanization was to welcome all foreigners, some groups were viewed as too disruptive for the rest of the pot. In this example, Irish radicals were seen as too unruly to mix in. At the height of their political power the Ku Klux Klan, in 1925, brought to the nation’s capital over 40,000 members in full regalia to promote their ideals of white Christian supremacy before the public. Out of belief or fear, many Americans sought to limit diversity in the United States. In the 19th century, agitation against Asian Americans spread across the country and led to some of the nation’s most restrictive immigration laws. The American Party, also called the Know-Nothings, was a major national political force in the 1850s. It saw immigrants and Catholics as the greatest threat to self-government and to the nation. Arguing for rule by native-born Protestants, the Know-Nothings ran former President Millard Fillmore as their presidential candidate in the 1856 election. Though James Buchanan won the presidency, Fillmore received over 21 percent of the vote. 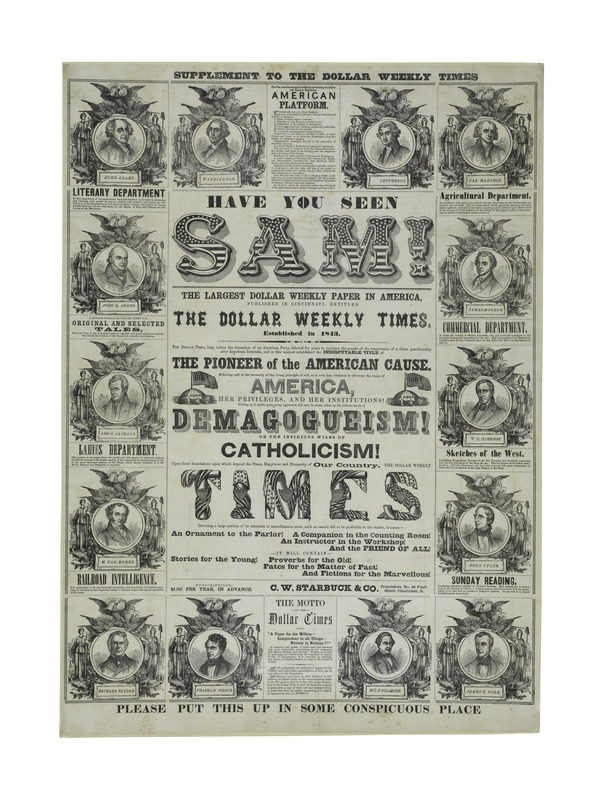 During the Civil War the movement fractured and largely disappeared, but fear and distrust of new immigrants remained within the core beliefs of many future political movements. Founded in 1866 in Pulaski, Tennessee, the Ku Klux Klan combated post-Civil War reforms and terrorized freed African Americans in the former Confederacy. 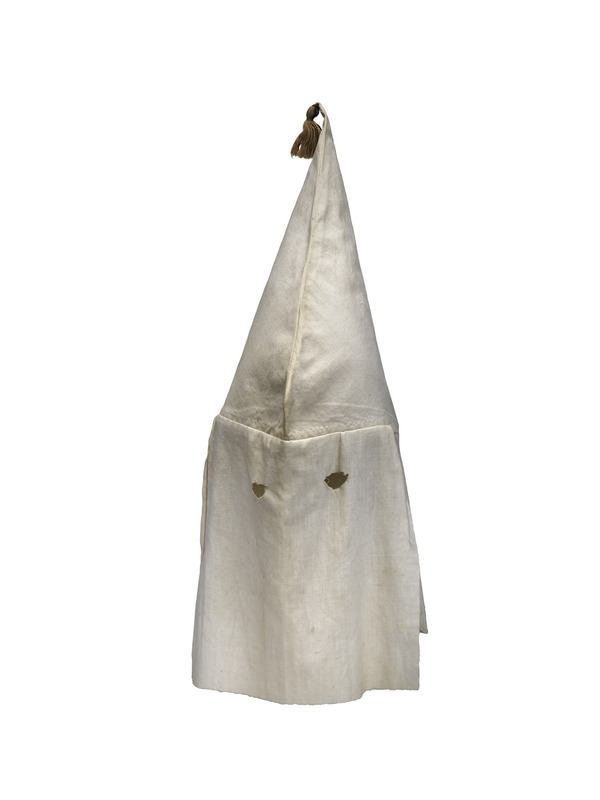 Dormant for decades, by the mid-1920s a reconstructed Klan was again a powerful political force in both the South and the North, spreading hatred against African Americans, immigrants, Catholics, and Jews. Klan membership plummeted after a series of scandals involving its leadership. Although never as powerful as it was in the 1920s, Klan organizations rose to oppose the growing civil rights movements of the 1950s and ’60s.